This list includes papers read by Darwin to the Geological Society of London, his books on the geology of the Beagle voyage, and other publications on geological topics. Author-date citations refer to entries in the Darwin Correspondence Project’s cumulative bibliography. Where appropriate, references are given to reprints available in John van Wyhe ed., Charles Darwin’s shorter publications, 1829-1883 (Cambridge: Cambridge University Press, 2009). ‘F’ numbers refer to R. B. Freeman’s standard bibliography of Darwin’s works. —Geological notes made during a survey of the east and west coasts of South America, in the years 1832, 1833, 1834, and 1835, with an account of a transverse section of the Cordilleras of the Andes between Valparaiso and Mendoza. Proceedings of the Geological Society of London 2 (1838): 210-12. —Origin of saliferous deposits: salt-lakes of Patagonia and La Plata. Proceedings of the Geological Society pt. 2, 2 (1846): 127-8. Rhodes, Frank H. T. 1991. Darwin’s search for a theory of the earth: symmetry, simplicity, and speculation. British Journal for the History of Science 24: 193–229. Rudwick, Martin J. S. 1974. Darwin and Glen Roy: a ‘Great Failure’ in scientific method? Studies in the History and Philosophy of Science 5: 97–185. Secord, James A. 1991. The discovery of a vocation: Darwin’s early geology. British Journal for the History of Science 24: 133–57. Stoddart, David R. 1976. Darwin, Lyell, and the geological significance of coral reefs. British Journal for the History of Science 9: 199–218. Greene, Mott C. 1982. Geology in the nineteenth century. Ithaca and London: Cornell University Press. Laudan, Rachel. 1994 . From mineralogy to geology. Chicago: University of Chicago Press. Rudwick, Martin J. S. 2005. Bursting the limits of time. Chicago: University of Chicago Press. Rudwick, Martin J. S. 2008. Worlds before Adam. Chicago: University of Chicago Press. 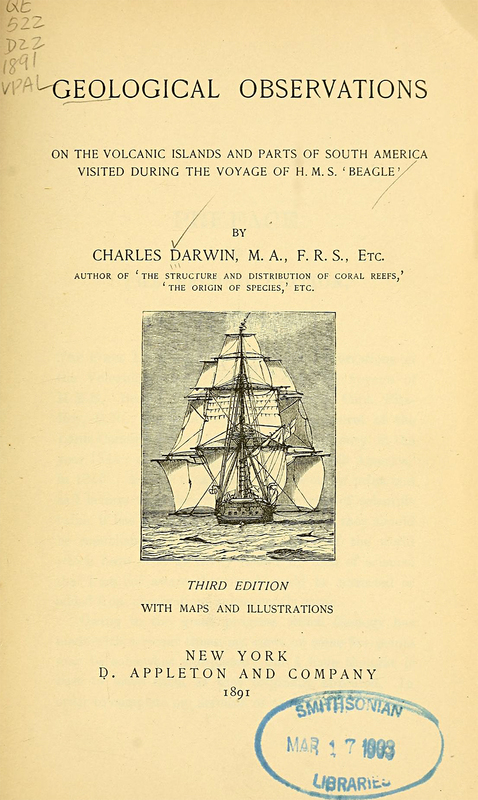 Full text of Darwin’s geological publications at Darwin Online. Sedgwick Museum, Cambridge: Darwin the geologist. Retracing Darwin’s geological fieldwork in the Galapagos.